Durable, Long Lasting Construction: Dual chamber design features an exterior of woven nylon mesh through two layers of heavy vinyl. Resistant to rot, mildew, and tearing. Patent Pending Heavy Duty Design: Add up to 500 pounds of weight with water with the heavy duty woven mesh reinforced vinyl construction. The baffle system prevents the water from sloshing around when its not cold enough for a freeze. Lies Flat With a Weight Capacity of 500lbs: ShurTrax lies flat so you can still haul stuff. Tough enough to support 500 pounds of cargo. As an added saftey feature ShurTrax provides a place to attach tie downs with solid brass grommets. Easy To Use: Pull out spout makes ShurTrax easy to fill and drain. A free universal fit garden hose connector is included. A free syphon pump is included with the Auto model. ShurTrax Warranty: Backed by a two year warranty against material defects and workmanship. Shure Trax traction control system is a safe, durable, easy to use alternative to dangerous concrete blocks and messy sand tubes. Now it's easier than ever to safely add weight to your car, truck, SUV, CUV, or van with Shur Trax vehicle traction control bag. ShurTrax is a great new product that cleverly uses water to add up to 400lbs of extra traction to virtually any vehicle. Designed to freeze, it has been tested to -40 below F/C without bursting. And because ShurTrax also helps level handling in the rain, ShurTrax can be used year round. If you want to store ShurTrax, just drain and roll it up. 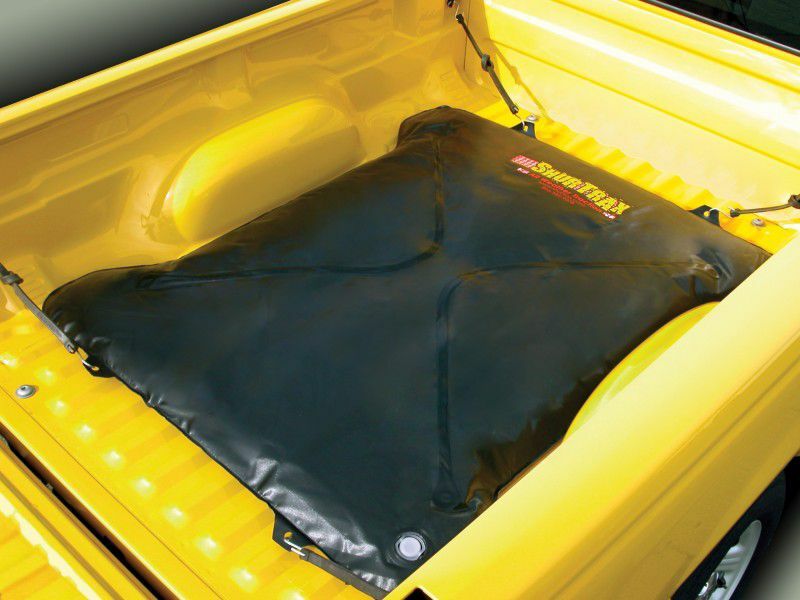 Manufactured from a super tough poly-vinyl, ShurTrax heavy duty construction is backed by a two year warranty and supports up to 500 pounds of cargo. Sand tubes are messy and some states have banned using concrete blocks in pickups. When you need added traction or weight, make tracks with ShurTrax. All filling components are included. The siphon pump is included with the car model. Full Size - LW-0056- This model ShurTrax is 60 inches x 56 inches x 3 inches with 48 inches between wheel wells and is designed to fit full size pickup trucks with short or longbeds. Compact - LW0048 - This model ShurTrax is 56 inches x 48 inches x 3 inches with 40 inches between the wheel wells and is designed to fit compact size pickup trucks with short or long beds. Auto/SUV/CUV - LW0036 - This model ShurTrax is 36 inches x 24 inches x 3 inches and is designed to fit all performance automobiles, SUVs, CUVs, Vans, and many other vehicles. All the same features as the others without baffling. At this size baffling is not necessary.